Strawberries contain five different acids: citric acid, ascorbic acid, malic acid, ellagic acid and pantothenic acid. The total amount of each acid varies based on the variety of strawberry, how it is stored and the storage period. The U.S. leads the world in strawberry production, with nearly 1 million metric tons grown each year, according to the "Handbook of Fruits and Fruit Processing." A member of the rose family, strawberries have a long history in the United States. When the first colonists arrived, native Americans were already using strawberries as an ingredient for cornmeal bread. Strawberries contain more citric acid than any other organic acid. Do not confuse citric acid with vitamin C. They are two different substances, although like vitamin C, citric acid is found mainly in citrus fruits and vegetables. It is sometimes used as a preservative to prevent food spoilage and as a flavoring agent. In "Human Physiology," Lauralee Sherwood writes that citric acid has a very distinctive, tart flavor. A cup of strawberries has about 85 g of ascorbic acid, or vitamin C. Up to 50 percent of that can be lost when strawberries are cut and exposed to air for five minutes or more. Children need vitamin C for growth. Your body also needs vitamin C to form blood vessels and to repair your skin, teeth, bones and cartilage. Vitamin C is also an antioxidant. According to the National Institutes of Health, antioxidants protect your body from the aging process, environmental damage and possibly chronic disease. 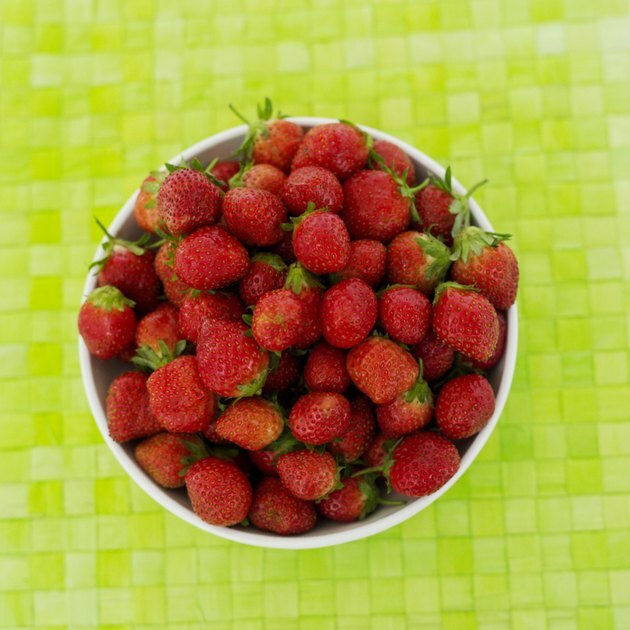 The amount of malic acid in strawberries decreases greatly based on the ripeness of the fruit. Although it naturally occurs in strawberries, apples, plums and other fruit, malic acid is also used as a flavoring agent for food and as an aging agent for wine. It acts as a preservative when added to fats and oils. Strawberries are a natural source of ellagic acid. According to the U.S. Department of Agriculture, researchers are investigating how to boost the ellagic acid content of strawberries because the substance might provide some protection against certain types of cancers, especially esophageal cancer. In the June 21, 2008, issue of the "World Journal of Gastroenterology," Mouad Edderkaoui writes that ellagic acid, in doses of 10 to 50 mmol/L, also slowed the growth of pancreatic cancer cells. Strawberries contain 0.18 mg of pantothenic acid, or vitamin B-5, which is part of the B-complex set of vitamins, which are vital to many important functions in your body, including metabolism, your nervous system and energy production. Pantothenic acid also helps create red blood cells and might help reduce the level of cholesterol in your body, according to the University of Maryland Medical Center.